Our LARGEST RANGE of Radial Tread Pneumatic Wheels ideal as replacement Wheelbarrow Wheels, boat launching trolley wheels all for outdoor applications. Choose from 3 popular sizes of 260mm, 370mm and best selling 400mm diameter. The Radial tyre pattern is a popular choice for gardeners and construction sites as the tread pattern does not encourage dirt and grit to stick. Our universal range of radial tyres has been designed to fit most axles on the market from hub bore sizes 12mm up to and including 1" (25.4mm ). 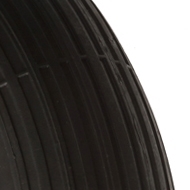 For a hassle free wheel choose a plain bore ( no bearing = PW ) air filled pneumatic wheel. If you require your wheels to move more easily, requiring less force to move your equipment opt for either a needle roller pneumatic wheel ( PWR ) or for wet or marince environemts a ball journal pneumtic wheel (PWP). For detailed advice and help in choosing the right wheel take a look at our measuring advice page.